4/5 A very satisfied parent as what was told during the time i was seeking admission is was the school is actually following. Very involved teachers and well thought out teaching. 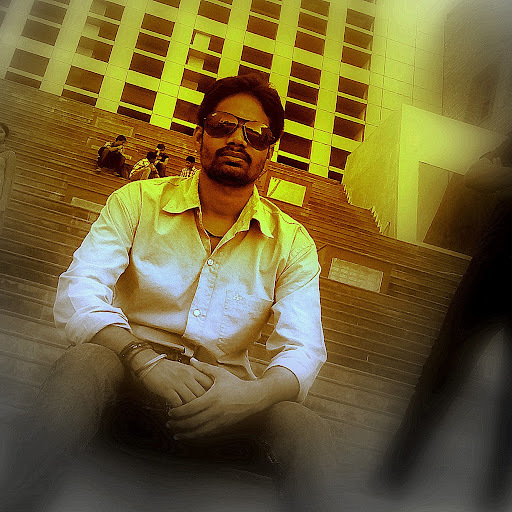 Moving from Pune i was very apprehensive but i see so much of a positive change in my child. Cheers to the team! 1/5 My son is in Xaviers since last year and am changing his school in the next session since paid the fee for entire year. Not very parent friendly and in addressing issues raised by parents. I meet new set of teachers for my child at almost all PTMs I attend. My sons class teacher changed three times in the last year and already twice this year. Newly appointed principal seems like managements puppet. St Xaviers High School Gurgaon Golf Course Extension Road is a Private Co-Educational School located in the Golf Course Extension Road neighbourhood of Gurgaon. It is popularly referred to as St. Xavier's High School Golf Course Extension Road. You can view the exact location or driving directions of the school on the map and school pointer on it. The school was founded in 2014 and currently offers Nursery, Kindergarden and Primary School. St Xaviers School Gurgaon Sector 49-50 Gurgaon proposes to be affiliated to CBSE. Vikash and 9 other people have rated this school. 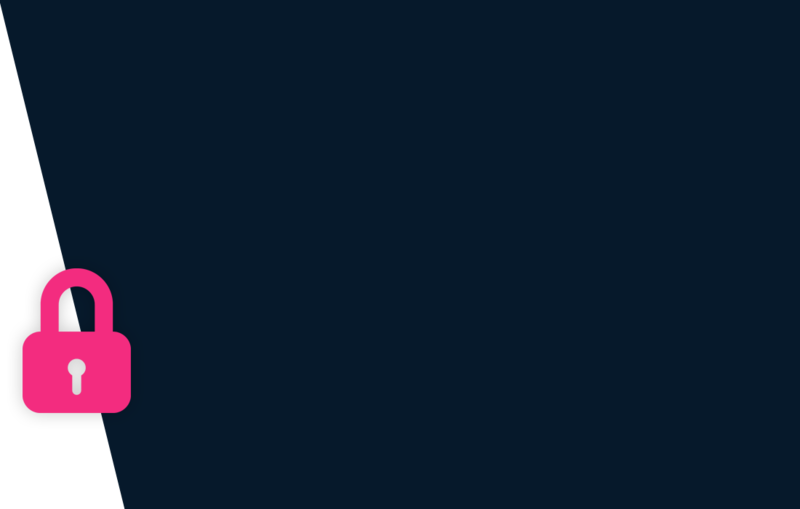 This school was last reviewed on 2 Aug 2018 and first reviewed on 8 May 2015 at SchoolWiser. The overall experience with St. Xavier's High School Golf Course Extension Road based on the ratings left by users so far seems to be average but the sample size of the ratings is insignificant. The ratings suggest that the school offers a lot in terms of the . It also scores reasonably on Classrooms, Variety & Campus. Though parents may seem to have some reservation over Teacher's Competence. Checkout detailed ratings and reviews below for reference but do exercise your best judgement. 24 reviews have been removed for violating SchoolWiser guidelines. The St. Xavier's High School symbolises excellence and aims to produce leaders of the future. We encourage our children to be curious so that they learn to question and discover the world around them. We help them to become individuals in their own right. The atmosphere in our school is conducive to progressive thinking, with an innovative approach to teaching. Consequently, the standards that we have set for ourselves are high. We assist our students to develop their intrinsic skill sets to the fullest., to explore their creative instincts and to grow into happy and responsible citizens in the future. The child needs to be minimum 2 Years as on 31 March 2019 to be eligible for Pre-Nursery admission. New academic session for the school starts from April. You can find further details below for reference on admission eligibility and application for Pre-Nursery and Higher Grades in the section below, but we strongly recommend that you check the school website for most accurate and up-to-date information. 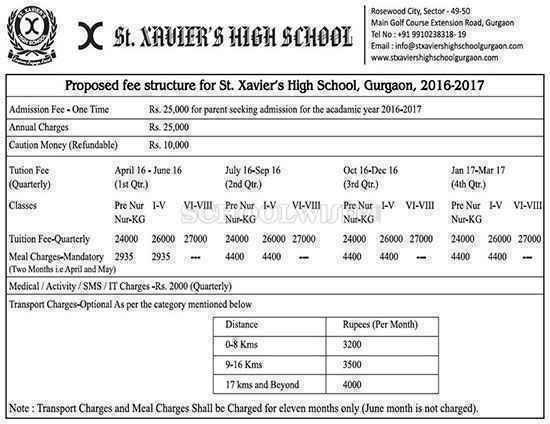 A detailed fee structure & complete breakup for St. Xavier's High School Golf Course Extension Road is provided below for reference. The objective of the fees details below is to provide an economic reference point for parents to understand approximate expense for this school and evaluate affordability based on their current circumstances and for the long term. 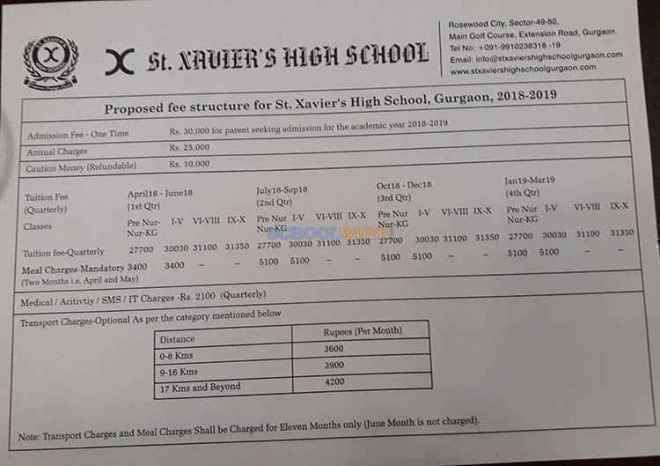 For parents admitting their children in admission session 2018-2019 at St Xaviers School Gurgaon Sector 49-50 Gurgaon the total school fees for the first year including all admission related charges for Pre-Nursery but excluding transport fees shall be around Rs.2,02,900. This includes total One-Time Admission related Charges including Refundable Security of Rs.40,000. For parents continuing in the school from previous years, the effective annual fees is around Rs.1,62,900 i.e. approx. Rs.13,575 per month or Rs.40,725 per quarter without transport fees. The school observed an overall fee increase of approximately 12% from the 2017-2018 session. SchoolWiser is usually one of the first places to look for breaking news on schools. St Xaviers High School Gurgaon Golf Course Extension Road was most recently in the news for Gurgaon kids’ date with Ruskin Bond. Get all the latest news and updates at SchoolWiser. Below we have aggregated relevant recent, ongoing & past news articles from leading publications such as TNN for St. Xavier's High School Golf Course Extension Road. The schools news links shall take you to originally published articles on external news sites.